The United Nations Educational, Scientific and Cultural Organization supported the initiative as part of UNESCO’s Excellence in Journalism Education Series for the International Programme for the Development of Communication (IPDC). The result: “Journalism, Fake News and Disinformation” published in the summer of 2018. She joined a stellar group of journalists, academics and media experts in producing the course that can also be used by newsrooms and anyone concerned by the distortion of information. 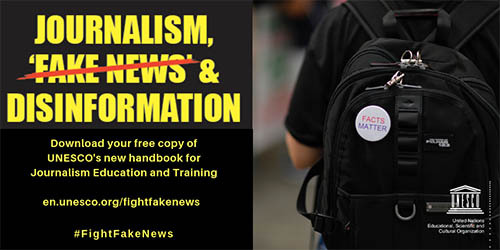 This handbook for journalism education and training is a 128-page compendium of seven modules comprising lessons, exercises, assignments, activities, materials, and resources to create awareness about an increasingly relevant topic. The full text can be downloaded here. It explores the very nature of journalism with modules on why trust matters; thinking critically about how digital technology and social platforms are conduits of information disorder; fighting back against disinformation and misinformation through media and information literacy; fact-checking 101; social media verification and combatting online abuse. Abu-Fadil’s contribution, Module 4 “Combatting Disinformation and Misinformation Through Media and Information Literacy (MIL)” can be downloaded separately here.